I found this website and seen some of your dogs of the month. I would like to put my dog Snapper up for this award! Snapper is almost 4 years old, and he is a wonderful dog. He is playful, protective, smart, and loves our family. Snapper also is a tough guy! 5 weeks ago he underwent surgery at the University of Minnesota, he had a bulging disk and had lumbar sacral stenosis. He had surgery to repair his disk and they put a couple screws in his back for stability, overall everything went well. The nurses said he seemed to recover very quickly, and they gave him a great bill of health! He went from going on walks every day, playing in the yard, and constantly wanting my attention to not being able to get up without crying. I'm a single guy that pays child support and this was something that I was not expecting to happen. It cost 3800.00 and counting to get my little buddy fixed and every cent was worth it. We are not out of the woods yet, but he is getting up now without hurting, and he is getting his energy and playful attitude back! Sometimes I have to ignore him because we still have 4-6 weeks of recovery, I can't let him get to worked up and playful. Snapper has some issues, he has allergies which get pretty bad at times, and he gets a little dominant, but overall he is the coolest dog a guy could have. The girls love him when we go on walks, they call him handsome, he has not got me a date yet, but we are working on it! Snapper also has one arrest credited to him. We live on a lake, and about 4 months ago, he woke me at 2:00 in the morning wanting to go outside. He went directly to the neighbors backyard and caught someone trying to break into their house. The guy was freaking out, as was I, I knew he wanted out because of something, but had no idea there was someone out there. I was able to phone the police, and the guy didn't move for 5 minutes out in the freezing cold, he got on his knees and said, don't let him bite me, that is all he could say. He wanted nothing to do with my pooch. He made me a pretty proud owner that night when the police were giving him treats and they gave me compliments on him. 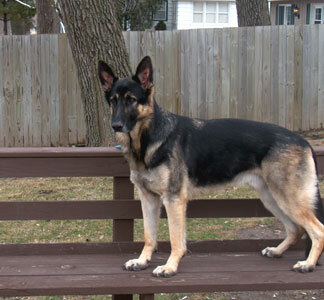 I believe Snapper should be GSD dog of the month because he has been through a lot, and he keeps on going. He is spoiled and I have not did all the training needed yet, but he is truly my best friend! 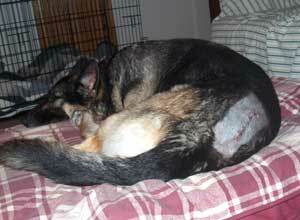 I attached some pictures, one is of his back 2 days after surgery and the day I brought him home.